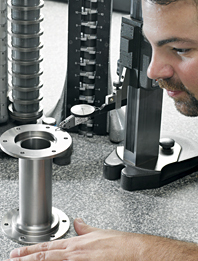 Mechanical Specialties Company is serious about quality control. Our clients demand it, and our team is dedicated to providing it. Our QA program incorporates a total quality management philosophy that stresses customer satisfaction through continual improvement, prevention and internal controls. All Mechanical Specialties Co. employees functioning within the Quality System ensure that products are of the highest quality, meet quality objectives and the customer requirements. We offer a full inspection process that conforms to our ISO 9001:2008 certifications and can offer full inspection detail to your specifications upon request. We meet the needs of Aerospace and Medical Industry quality requirements, and are a FDA registered Contract Manufacturer. With stringent requirements like these, we’re confident we can meet your quality expectations also. Each order is processed immediately upon receipt to ensure that material is ordered to arrive in a timely manner. The prints and tracking forms are sent to the shop for manufacture where the machinist checks parts in process and at the completion of the manufacturing process. If any further process or finish requirements are needed, the parts are inspected before and after these processes to ensure quality standards are met. Parts are then sent to final inspection based on our customers needs whether it is a simple Certificate of Conformance or First-Article with Formal Inspection of a sampling or 100% of the parts based on requirements. “Mechanical Specialties Co. has been a tremendous strategic asset to our company delivering high quality precision parts on a very competitive basis- with quick turnaround. They are very easy to work with and bring ideas that help us meet key customer needs.” Custom Spine Inc.
“Mechanical Specialties Co. has done outstanding work for us on a multitude of projects providing high-quality products with fast turnaround times and very reasonable prices. Their electric-discharge machining expertise has proven invaluable to us and has made possible complex geometries that have satisfied our customers needs.” Project Engineer -Stryker Spine.